New Jersey-bred Golden Brown, winner of the 1 1/8-mile Kent Stakes (G3) on turf this summer, cuts back to sprinting in his return to the main track for Saturday’s $100,000 City of Laurel at Laurel Park. The City of Laurel for 3-year-olds and the $100,000 Safely Kept for 3-year-old fillies, both at seven furlongs, are among five stakes worth $500,000 in purses on a 10-race Maryland Hall of Fame Day program. First race post time is noon. Also on tap are the $100,000 Richard W. Small for 3-year-olds and up featuring graded-stakes winners Something Awesome, Name Changer and Doctor Mounty and Maryland Million champions Bonus Points and Talk Show Man, and a pair of six-furlong sprints for juveniles, the $100,000 James F. Lewis III and $100,000 Smart Halo, the latter for fillies. Golden Brown drew the rail in a field of nine and shares top weight of 120 pounds with Smooth B, two pounds more than their seven rivals. The Pat McBurney trainee has made four straight starts at nine furlongs, all in graded-stakes, most recently running sixth in the Hill Prince (G2) Oct. 6 at Belmont Park after pressing the early pace. 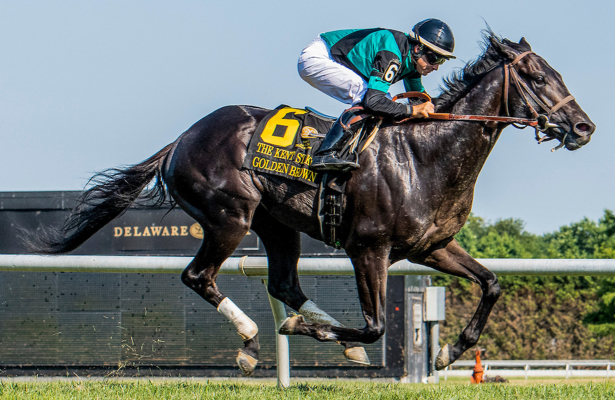 The Offlee Wild colt came from a stalking spot to run down the leaders and win the Kent by 1 ¾ lengths, then ran fifth to Good Magic in the Haskell (G1) July 29. The Haskell was Golden Brown’s lone dirt try since beating his state-bred elders in a six-furlong allowance May 26, also at Monmouth. Golden Brown has two wins and two seconds in six dirt races, breaking his maiden on a sloppy Parx track Feb. 24 prior to his allowance win. Sheldon Russell is named to ride for the colt’s Laurel debut. Wertheimer and Frere’s Rugbyman returns to Laurel after defeating older horses in his only previous trip, an open one-mile allowance Sept. 21 for Fair Hill-based trainer Graham Motion. The Tapit colt followed up finishing third by 1 ½ lengths in a 1 1/16-mile optional claimer Oct. 21 at Keeneland behind multiple stakes winner Bal Harbour. Rugbyman also beat his elders in just his second start, a 14-length maiden special weight romp in the Belmont Park mud May 13, also at a mile. He was stretched out to 1 1/16 miles in the Easy Goer, running second by a neck, and 1 1/8 miles in the West Virginia Derby (G3) Aug. 4, where he was no factor. In between he was fourth to Grade 1 winner Firenze Fire in the Dwyer (G3). Jacks or Better Farm’s Grade 3-placed homebred Old Time Revival enters the City of Laurel off his first career stakes win, a nose triumph in the seven-furlong Challedon Sept. 29. The win improved the Brethren colt’s record at Laurel to two wins, two seconds and two thirds from nine tries, including runner-up finishes in the Miracle Wood Feb. 17 and Concern July 7. Old Time Revival, second in the Gotham (G3) this winter at Aqueduct in his sojourn on the Triple Crown trail, tuned up for his latest assignment with a half-mile breeze in a bullet 47.60 seconds Oct. 26 at Laurel. Oldies But Goodies, Shane’s Jewel, Sparticle, Majestic Dunhill and Cordmaker are also entered.